With evergreens dappled with new-fallen snow, frozen lakes, and ponds etched with the graceful patterns unintentionally left behind by ice skaters, snowmen winking knowingly at couples in love, winter in New England is a time for romance. After a day of playing in the snow or strolling arm-in-arm through this winter wonderland, nothing is quite as romantic as retiring to your room at a charming and cozy inn or bed & breakfast and lighting a crackling, comforting fire in your own fireplace. Many of the region's B&Bs and inns have a few rooms with fireplaces, but when you want to be sure of winter warmth, reserve your room at one of these New England inns where you'll find a fireplace in each and every guest room. All 18 rooms at The Inn At Stonington, located on the Connecticut shoreline, feature fireplaces. Complimentary wine and cheese are served each evening in the inn's water-view parlor. Foxwoods and Mohegan Sun casinos and the attractions of Mystic, Connecticut are all nearby if you can tear yourself away from the glow of the fire. At Rock Hall in Colebrook, Connecticut, you'll find four elegant guest rooms with fireplaces, plus wonderful common areas where you can retreat on a chilly day including a movie theater, billiard room, library, great hall with its own dramatic fireplace and a game room outfitted with everything from a ping-pong table to a pinball machine. This 1912 mansion designed by architect Addison Mizner of Palm Beach fame retains its Jazz Age vibe and air of sophisticated seclusion. Each of the seven rooms at Victorian by the Sea in Camden, Maine, has its own working fireplace to help you fight off winter's chill. You'll have wonderful views of Penobscot Bay from this Victorian-style inn built in 1889 as a summer cottage. With your fireplace casting a cozy glow, you may never feel the need to venture outdoors once you've checked in, but the charming coastal town of Camden is worth exploring. Head to the quiet Cape this winter to rekindle your bond beside a blaze in your room at the Captain's House Inn. Located in charming Chatham, Massachusetts, a town known for its distinctive shopping and community events, this inn's 1839 mansion main house, attached carriage house and converted stables all have guestrooms with gas fireplaces. The Notchland Inn in Hart's Location, New Hampshire, has 12 guest rooms, all with real wood-burning fireplaces. This 1860s granite mansion is set on a 100-acre estate within the White Mountain National Forest, which means that you can spend a day skiing, skating, or snowshoeing, then return to this cozy, romantic retreat for an evening of dreaming by the fire. Call 603-374-6131 or 800-866-6131 (toll-free) for reservations. The Lake Opechee Inn and Spa in Laconia, New Hampshire, has 34 individually appointed rooms, and, you guessed it, you'll find a working fireplace in each one. Many also have two-person whirlpool tubs, and two rooms are available for guests traveling with friendly dogs. With its own steak and seafood restaurant and lakeside spa, this Lakes Region retreat in a historic mill building offers warmth and contentment under one roof. Call 603-524-0111 or 877-300-LAKE (toll-free) for reservations. Each individually decorated guest room at the Adele Turner Inn in Newport, Rhode Island, features a fireplace that will chase away your winter blahs. 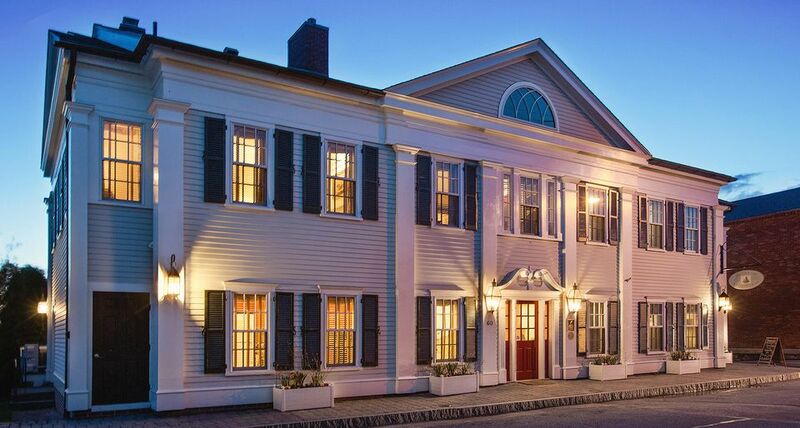 The Victorian inn was built in 1855 to house the sea captains and officers who visited this historic port city. When you visit Newport in the winter off-season, you'll find opportunities to enjoy the area's attractions without the parking hassles and restaurant lines characteristic of the summer high season. Call 401-848-8011 or 888-820-8011 (toll-free) for reservations. Another Newport option is the Sarah Kendall House, which dates to circa 1871 and offers five bedrooms, each with a working fireplace. Not only is a full breakfast included with your room rate, you'll also enjoy afternoon treats. You may find yourself torn between spending time in your fireplace room or heading up to the Tower Sitting Room in the cupola for views of Newport harbor. In Wyoming, Rhode Island, the riverside Stagecoach House Inn has two fireplaces from the 1700s, when stagecoaches would stop here for the night. The updated inn also has gas fireplaces and Jacuzzi tubs in each guest room, and rates, which are particularly affordable in the winter months, include a deluxe continental breakfast. Call 401-539-9600 or 888-814-9600 (toll-free) for reservations. At Stone Hill Inn in Stowe, Vermont, every one of the nine guest rooms has a flickering gas fireplace that opens to both the bedroom and bathroom, plus a fireside Jacuzzi for two. What more could you long for on a blustery cold New England day? Stowe is, of course, one of Vermont's most popular ski resort areas, so you can combine a day on the slopes with the romance and relaxation of flickering flames and a bubbling whirlpool bath.